Cut the flour into 1/2-tablespoon pieces. Put into the freezer for 10 to 15 minutes. . Mix the flour and salt in a large bowl or place into a food processor fitted with a steel blade. Cut in the butter with a pastry cutter or using the food processor until the combination resembles coarse meal. Add the ice-cold water, one tablespoon at a time, until the mixture forms a ball. Put the ball onto a lightly floured counter and knead lightly to form the ball into a palm-sized disc. Cover with plastic wrap and chill for at least one hour, but preferably overnight. Put the disc onto a lightly floured surface. With a rolling pin, roll it out roughly to a 12-inch diameter. 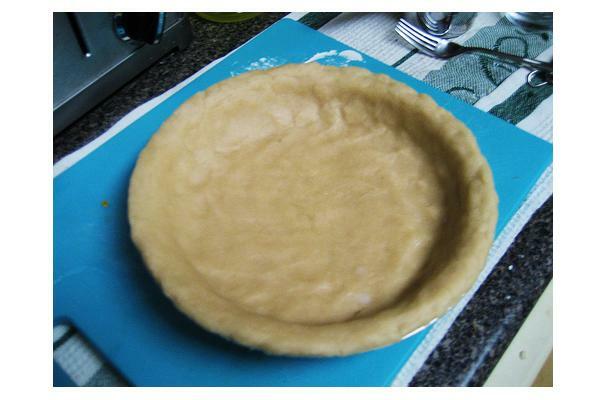 If using it for a pie crust, carefully set the crust into a pie form and press into the plate. You can either fill the crust at this point, or "blind bake" it in a 375 degree oven for about seven minutes or until just lighty cooked. To keep the crust's shape, top it with a piece of parchment and fill in with baking weights or dried beans for the first few minutes of baking.